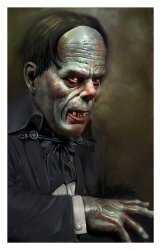 Up and coming horror artist Rob Birchfield's "A Night at the Opera" Phantom. 11X17 Giclee Print on Fujicolor Crystal Archive Paper. Shipped in a heavyweight tube and mailed directly to you from the artist. Buy 1 or 10 it's a $5 flat-rate shipping for any quantity of prints!